excerpt from gallery website.... 'Referencing early still life paintings, Stilleven ( Flemish for Still Life ) highlights artworks from a group of contemporary artists who, for this exhibition, have chosen still life as the subject of their artworks and in some cases harnessing modern technology to stunning effect. Historically, still life painting presented a perfect opportunity to show off an artist’s aptitude in painting textures and surfaces in great detail. Foods of all kinds laid out on a table, silver cutlery, pottery, intricate patterns, subtle folds in tablecloth’s and flowers were the frequent subjects of choice. 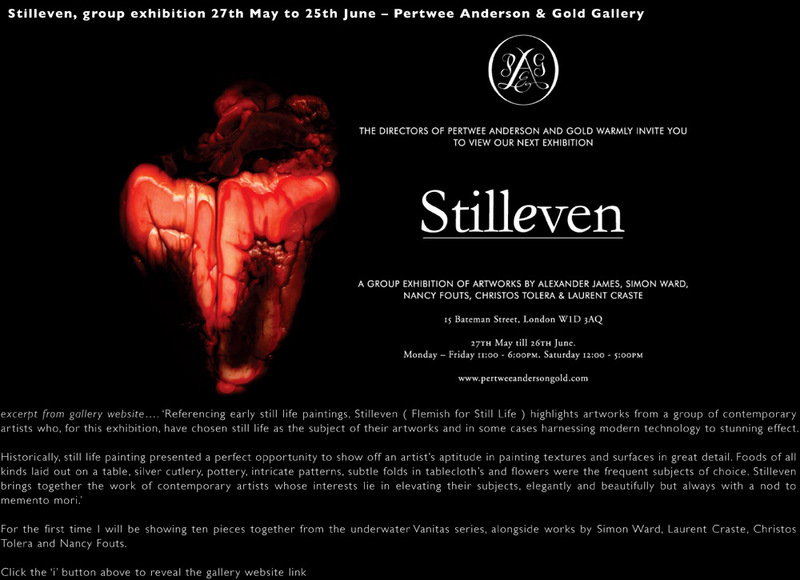 Stilleven brings together the work of contemporary artists whose interests lie in elevating their subjects, elegantly and beautifully but always with a nod to memento mori.' For the first time I will be showing ten pieces together from the underwater Vanitas series, alongside works by Simon Ward, Laurent Craste, Christos Tolera and Nancy Fouts.